I have been making ice cream from scratch for a few years now. Until recently, I was storing the ice cream in airtight Tupperware containers. It worked fine enough. But one day not too long ago, my mom bought me an ice cream container from Crate and Barrel that advertised it could keep a pint of ice cream frozen for 90 minutes outside the freezer. What!!! Turns out the Crate and Barrel container was just repackaged for the store, but it's actually a Zak Designs Ice Cream Tub. 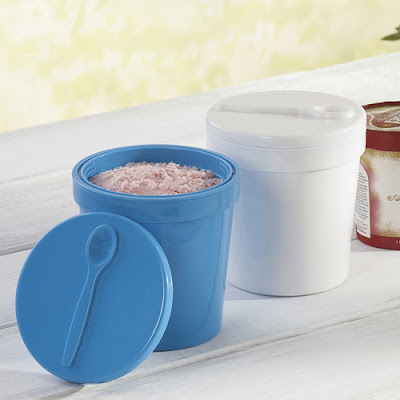 It has insulation in both the tub and the lid that keeps the ice cream from melting! And I know it works as I've tested it! The tub comes in four colors: green, orange, blue, and white, and costs about $12. The lid twists on and off easily. Plus, isn't that spoon on the lid adorable? Let's just pause for a second on the fact that you can keep the ice cream out for 90 minutes. That's life changing! Earth shattering! It means you can bring it to a picnic and it won't melt right away while you eat your sandwich and potato salad first. It also means you can drive with it to a party, even a party that is 50 miles away, and it won't melt in the car! It's also great at home when you're hosting a party, ice cream social or any theme, and you want to leave the ice cream flavors out so people can serve themselves. Before this tub, I'd take my Tupperware container out, serve everyone at once, and then put the container back in the freezer so the ice cream doesn't melt. If anyone wanted seconds, they'd have to take it out of the freezer. See! Colossal! Most of the time, I only make one ice cream recipe at a time, but last week I made a few ice cream flavors and only had the one white Zak Designs tub my mom got me at Crate and Barrel. It was then I realized I'd need to place an order for some more tubs...stat! So I went to Amazon and purchased the orange and the blue. I'm still holding off on the green, despite LOVING the color, because sadly it's the one color that is not eligible for Amazon Prime and I refuse to pay for shipping when I don't have to. If you make homemade ice cream, you really should invest a couple bucks into one of these containers. It will change your life forever and the way you think about ice cream. Heck, you could even buy one for a friend, make ice cream, fill it with that ice cream, and drive it to the friend's house to present it to her with a nice big ribbon. She gets ice cream and a container out of it, plus you've just proven to her that it works as you sat in traffic for 30 minutes to hand deliver it! Ain't that sweet! I love your gift idea! What a wonderful and unique gift that would make! Your freezer must look very colorful! holy cow these are AMAZING! I'm churning 4 pints of ice cream later this week, and desperately need this... but still! $12 each for silicone? I can't pull the trigger! That would be a great gift. In fact, I have a friend who LOVES making ice cream, whom I just might have to get one for. You raved so much that I had to do it--I bought two from amazon.com! I do enjoy making homemade ice cream, so I was thrilled with anticipation of my new toy. Only to have it arrive, and discover how small a pint really is. I definitely need this item in a quart size, and can't seem to find it anywhere online. Have you seen them in graduating sizes?